As Vice President, Marketing & Production, Gretchen Libby is responsible for overseeing global production management for Industrial Light & Magic. This involves client marketing strategy and bidding activities, as well as driving the production process including global capacity management, tax incentives, and talent strategy to ensure ILM meets its clients’ needs in a cost effective manner while putting creativity and excellence first. 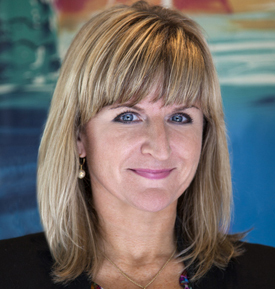 Libby joined ILM in 1997 as the Sabre department production manager. The following year, Libby moved to ILM’s feature production department as an associate producer on The Perfect Storm. She was promoted to visual effects producer in June 2000 on Star Wars: Episode II Attack of the Clones. Libby served as visual effects producer on several films before being promoted to executive producer, where she oversaw such films as Iron Man, Avatar, and Jurassic World. Prior to ILM, Libby worked in visual effects film production at Pacific Data Images in Palo Alto, California, and in visual effects commercial production at both Image Design and Aoki Studios in New York City. Born and raised in Portland, Maine, Libby is a graduate of Boston College in Chestnut Hill, Massachusetts, with a BA in Communications and Film. She currently resides in Marin County, California.